DALLAS – Former Florida State star Dalvin Cook will participate in the 2017 State Farm All-Star Football Challenge on Jan. 30 at AT&T Stadium in Dallas. Cook will be the third Nole in two years to compete in the event, joining cornerback Jalen Ramsey and kicker Roberto Aguayo who participated in the 2016 Challenge. The annual program is scheduled to air Friday, Feb. 3, at 9 p.m. ET on ESPN2. The event will have encore airings on ESPN at 1 p.m. ET on April 8 and on ESPN2 at noon ET on April 23. 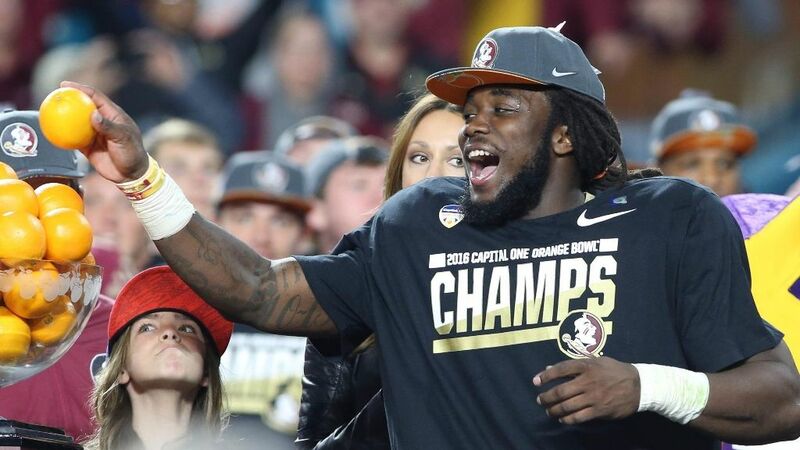 Cook declared for the NFL draft following his MVP performance in the 2016 Capital One Orange Bowl, where he ran for 145 yards and scored a touchdown in the Seminoles’ 33-32 victory over No. 6 Michigan in his hometown of Miami. The performance punctuated an incredible three-year career that saw Cook finish as FSU’s all-time leading rusher (4,464 yards) and career leader in rushing touchdowns (46), while setting the ACC record for career rushing yards per game (117.5). His rushing mark is the 11th-most in NCAA history by a player in his first three years. His 2016 season will go down as the greatest by a running back in school history as his 1,765 rushing yards and 2,253 all-purpose yards broke his own school records set in 2015 (1,690 yards, 1,935 all-purpose). Cook finished with 20 overall touchdowns for the second straight season and led the ACC in rushing for the second straight year. He captured unanimous All-America honors. The 2017 State Farm All-Star Football Challenge has been reimagined for its 19th edition. For the first time, the skills competition will feature 24 of college football’s brightest stars divided into six teams based on their college conference. Each team will consist of four players from the same conference that will compete for conference supremacy in a series of skills competitions. The conferences represented are the ACC, the Big Ten, the Big 12, the Pac-12, the SEC, and four of the best players outside of the Power Five that will be called the “Wild Card” team. Each team will also be designated a current NFL player that was a prolific college star in that team’s conference to serve as a coach and mentor throughout the competition. Each player will individually participate in a timed event, and then finish with a full team event. Events will all be timed and have individual winners that will compile into a cumulative score to determine the winning team. For example, the quarterbacks from each team will all compete against each other to win their competition. But ultimately, their time will be added to the times of the other competitors on their conference designated team to determine a final team score. Individual events in the 2017 All-Star Football Challenge include: the State Farm QB Accuracy Competition, the PlayStation Hands Competition, the Be The Match Lineman Strength Challenge and the Mercedes-Benz Obstacle Course. To conclude the program, the players will compete as teams in the State Farm Team Competition.